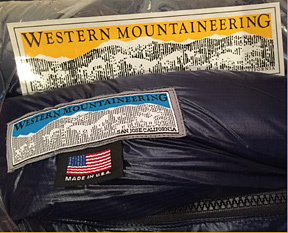 WESTERN MOUNTAINEERING-- One of the great Bay Area gear companies of the early days, and still in operation today! 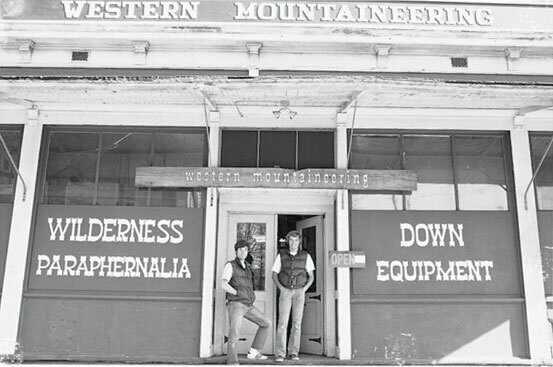 Gary Schaezlein and Jeff Jones were two guys behind the founding of Western Mountaineering, aka at one time: "Western Mountain Sports." Gary and Jeff are seen below in the doorway of their original store in the early 1970s. Gary on the left side with dark hair, and Jeff on the right side with blonde hair. This was in San Jose, California, near San Francisco.... Active at this time in the general area of San Francisco were Sierra Designs, North Face, Ski Hut/Trailwise, Wilderness Experience, and Snowlion. Snowlion and Wilderness Experience had also just started, whereas the other companies were a few to several years older. In my conversations with Gary Peterson (Production Manager with the company 23+ years), I found Gary especially proud of the sleeping bag designs he and the company have perfected over the many years they have been in business. The company currently occupies a revered position as a maker of the very most premier down sleeping bags in America. Also to be noted is their line of down garments. Below is my 2015 Western Mountaineering "Terralite" sleeping bag (dark blue), filled with 850+ fillpower down, weighing just two pounds despite having a relatively wide cut to accomodate side sleepers like me. Rated to 25 degrees. INTERNATIONAL SALES: Western Mountaineering, as of 2015, has also expanded very significantly into international markets, to the point that 50% of what they make is now exported. Germany and Canada make up half of Western's markets, while Denmark, Sweden, Norway, Switzerland, England, Japan, South Korea, and Australia comprise the balance of their international market. The Current Status of the Company: alive and well, and still in San Jose, California, and still ALL PRODUCTS are MADE IN AMERICA, one of the very few gear companies still able to make that claim. BOOKS ABOUT THE HISTORY OF GEAR! MY BOOK ABOUT FROSTLINE KITS CONTAINS A GOOD DEAL OF ADDITIONAL INFORMATION AND NEW PHOTOGRAPHY. PLEASE VISIT MY FROSTLINE PAGE IF INTERESTED. NEAR THE TOP OF THAT PAGE YOU WILL SEE A "BANNER" THAT YOU CLICK ON TO GET TO MY PUBLISHER....My second book in the History of Gear series tells the story the story of GERRY Mountain Sports, and is titled "GERRY, To Live in the Mountains." It was released May 20, 2008. 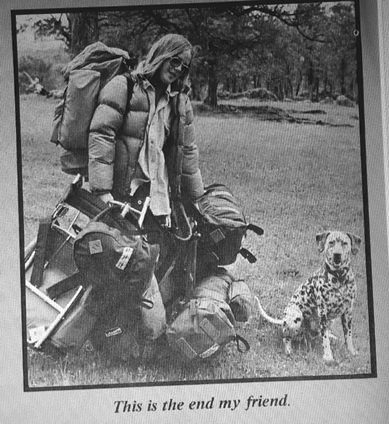 The third book in the series reveals the life and times of Roy and Alice Holubar, and is titled "Holubar Mountaineering Ltd." The writing of the Holubar book had lots of help from its ex-President Jim Kack, from Roy and Alice's daughter, and also from numerous other ex-Holubar staff. More recently, I've published books about the early histories of Mountain Safety Research (MSR), and about one of the oldest names in the business, Stephenson's Warmlite Equipment. Main Page: Essays and pictures about the Pioneers of the Outdoor Gear Revolution, 1935-The Present, 45+ pages, Six published books, and still expanding!